The suspension and dismissal of executives at Broadband Infraco is what’s behind an anonymous letter sent to public enterprises minister Malusi Gigaba and the Public Protector, says acting CEO Andrew Shaw. The allegations contained in the letter, dated 14 July, are “without basis in fact”, he says, and serve only to undermine the turnaround strategy that management at the state-owned telecommunications company is putting in place to ensure the long-term sustainability of the company. Infraco was the brainchild of former public enterprises minister Alec Erwin as an alternative to Telkom in wholesale long-distance telecoms infrastructure. Shaw says he inherited a mess when he took the reins at Infraco. As part of a clean-up of the organisation, about half of the senior executives at the company have been “disciplined” — either fired or suspended pending hearings at the Commission for Conciliation, Mediation and Arbitration. That process is running its course. The cases relate mainly to alleged irregular and fruitless expenditure. Shaw says he’s not sure if corruption was involved in any of the cases, but he expects the findings of an investigation by independent auditing firm Deloitte to show whether this was the case. He admits there is a high level of animosity in the corridors at Infraco, with some employees feeling the process of terminating and suspending executives was “vindictive”. But, says Shaw, the company “acted entirely on evidence presented by the auditors”. Shaw says Infraco has struggled to establish itself and demonstrate that it is sustainable. He says that under his leadership, the company has developed a new corporate plan — still subject to approval by government — that he believes will ensure sustainability in the long term. He’s reluctant to share intricate details of the plan until government has had a chance to assess it. However, it involves the company focusing on its core mandate of providing high-capacity intercity fibre and access to submarine cable systems and then providing complementary services around that infrastructure. Shaw emphasises that Infraco has no plans to compete in the “last mile” with retail operators. This is something that has concerned some Internet service providers and telecoms operators. Rather, he says, it will focus on providing wholesale services only. 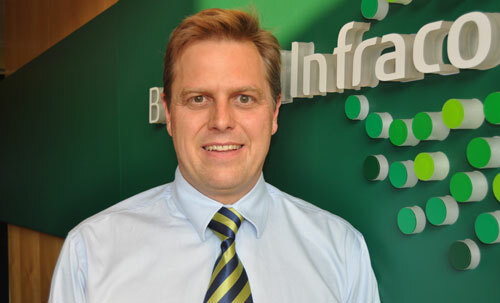 Infraco plans to spend R170m building infrastructure in the 2011/2012 financial year, but Shaw says it would like to expand that to between R600m and R700m in future years once the company’s processes, especially its procurement systems, are more robust. The strategic plan will require Infraco to borrow money in the financial markets, though Shaw says it’s too early to say how much debt it will take onto its balance sheet. However, he says initial discussions with potential funders have been positive and it does not appear they will ask for government guarantees to provide funding. Building relationships with private-sector operators will be key to Infraco’s long-term success, Shaw adds. He says incidents like last month’s anonymous letter serve to “break down that trust, even though our service reliability exceeds what customers signed into”.